How accurate are the smoking and drinking habits of the characters on Mad Men? Though the stories and characters have become the focal point for analysis as Mad Men has evolved, early in its existence there was a great deal of discussion regarding the amount of smoking and drinking the characters do. (See this New York Times article from 2007 for one example). How accurate is this presentation? Is that what the advertising world was like in the 1960s? What about other businesses? Essentially: is the portrayal of business professional smoking and drinking in excess while at work presented in Mad Men accurate? Q: Did ad agency executives really drink that often — and that much — in the 1960s? A: If anything, it's underplayed. There was a tremendous amount of drinking. Three-martini lunches were the norm. Q: But the show makes it look like everyone kept a bottle or two in their desk drawer. And it wasn't Geritol. A: Bottles in desk drawers were not the exception but the rule. I had an open bar at the agency in which I kept 10 to 15 bottles of booze. Anyone at the agency could walk in and get it. Invariably, one or two guys would come in at 9 a.m., pour a shot and slug it down. It was a business of drinking. The way we lived really would make the characters in Mad Men all look like Rebecca of Sunnybrook Farm. We drank and screwed around. Q: Did agency executives really smoke that much? A: I smoked three to four packs a day. Everybody smoked at all times in all meetings. Once, when I was sitting in a meeting for the Contac account, I had a (lit) cigarette in my hand and another in the ashtray. When I put down the cigarette to do a chalk talk, I tried to light the piece of chalk. My grandmother used to be a big city office secretary back in the late 1950s and early 1960s when she was in her 20s before she became a housewife and she has told me that most people smoked in the office back then and it was very normal. She said her boss usually smoked two to three packs a day just at the office and that she'd have to empty his ashtray several times a day and also bring him a fresh cigarettes anytime he asked for it. She said she was expected to keep at least two cartons of cigarettes in her desk drawer for him so he didnt run out, and that she was told to order his cigarettes just like ordering office supplies for pens, paper, staples etc. He also told her she could order herself cigarettes when ordering his, and as long as she smoked the same brand he did, she could smoke all she wanted while at work. She also told me that her boss drank often at work, and that he kept both several bottles on a bar at the back of his office and that he also kept a bottle or two in his desk. Again, she said hed have her order bottles for him to keep in her desk as backup. She also said that it was not uncommon for the guys to go out for drinks after working late, but also that on more than one occasion her boss would take her out to a fancy dinner in the City, just the two of them, even though he was married to another woman. When I told her how strange that seemed now, she just laughed and said I would even recognize the workplace, especially with all the sexual harassment suits and stuff now. That was of particular interest to me since I had been the subject of sexual harassment at the workplace recently, and I asked her if shed ever been harassed. She said "not unwillingly" and proceeded to tell me about how she used to sleep with her boss from time to time. Yikes. 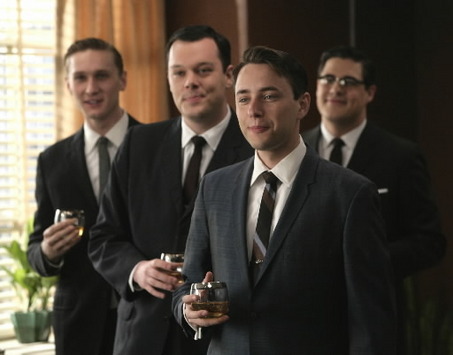 My mother was an office secretary in New York in the 1960s and 70s, and she told me that the general representation on MadMen that a lot of people really did chain smoke three of four packs a day back then was actually pretty dead-on accurate. She said that she continued to smoke at least three packs a day herself back then through the 80s and most of the 90s, even after she moved to the southern US, before eventually trying to cut down to only a pack a day in the early 2000s shortly before being diagnosed with emphysema. With that kind of background, it seems almost inevitable that I would have ended up a two pack a day smoker myself, even though our company banned smoking in the office back in 2003. I had just started working in the office in the late 90s, and a big attraction for me was the fact that several other women here had ashtrays on their desk and could smoke at work. It was frowned upon even then, despite being allowed, but the first 4 or 5 years I worked here, I could smoke at my desk and it wasn't a big deal. But then in 2003, once they banned smoking in the office, I think my office productivity took a nose dive. I'm only 43 and even going back to when I started work (1990) in the IT industry in the UK smoking was rife in almost offices and I worked alongside guys who would routinely go out drinking quite heavily for two hours at lunch. I have a friend who works for a large Japanese company at their head office and even today they smoke a very great deal in their open offices and there's a drinks cabinet in most senior's offices. So this wasn't too long ago, I'd imagine MM was pretty much on the money. Yeah, people smoked and drank a lot in the 50s/60s. You can see it even in family TV shows like I Love Lucy, early episodes of The Flintstones, Bewitched - I don't think a single episode of that show ever passed without someone having at least one drink - and in most of the family adventure shows, like Mission Impossible and The Man From Uncle and Voyage to the Bottom of the Sea, members of the principle casts all smoked from time to time on camera. Heck, there's an episode of Star Trek where you can clearly see cigarette smoke where an actor hastily put his hand out of shot to hide that he was smoking (McCoy/DeForest Kelly). Not the answer you're looking for? Browse other questions tagged mad-men . In Mad Men, is the firm of Sterling Cooper Draper Price (or its earlier iteration, Sterling Cooper) based on a real advertising agency? What lead to Don and Betty getting divorced on Mad Men? What happened between seasons 2 and 3 of Mad Men? In episode 10 season 1 of Mad Men, how did Pete find out that Roger was in the hospital?